Alpine Meadows Retreat Center has a large, modern kitchen. It is staffed by a team of professionals who provide delicious meals for your hungry participants. Despite our remote location, we receive frequent fresh food deliveries all year. All lunches and dinners include fresh salad bar and dinners always include homemade desserts. Breakfast comes complete with cereal and oatmeal bar. In our main dining hall, coffee, tea and fresh fruit are available throughout your stay. In addition to our standard hearty mountain fare, with at least three weeks advance notice our kitchen team can prepare meals for groups with special dietary requirements. For the more discriminating palettes ... why not upgrade your meal plan? 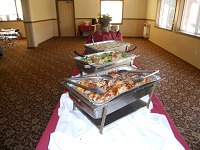 Try the BBQ, Prime Rib, Mahi Mahi or Honey Lime Chicken. At least three weeks prior notice required. Fees will be adjusted accordingly. 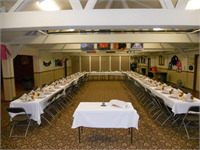 The camp kitchen has been modified and all meals are prepared and served kosher. Vegetarian, vegan and banquet menus available upon request. Don’t leave your good eating habits behind on your retreat or vacation.